First snow fall. Why do I always see animals in the snow? That's a fun picture! 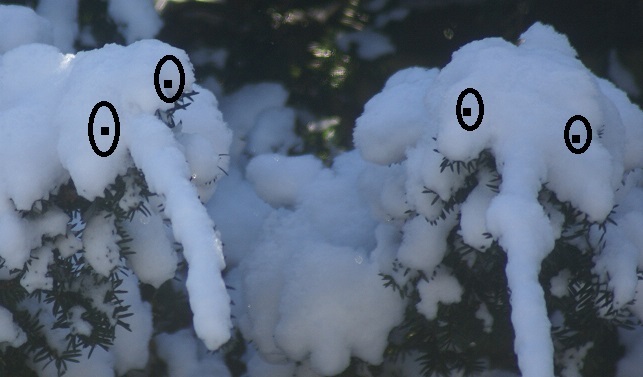 I too see creatures in snow. Funny you should mention my roof surviving these temp swings ... when it all began to happen about a month ago we had gunshot frost in the attic BUT ? I told Garden PA that one of those cracks was TROUBLE ... got some guys in and YES ! one of the webbing structures split big time and the others are in need of tightening. a good chunk of money to get it fixed but that is life right ? One thing right after the other ... BIG sigh ! Keep warm girl and dream of Spring !! Hi Patsi, that is funny! Fantasy like creativity has no limits I guess :-)! PS Patsi girl I meant to type "shotgun frost" ... it is when the extreme change of temperature happens in the timbers of your house .. the cracking sounds like a shotgun .. we had it here and that is why I knew something happened in the attic .. it is costly to fix when timber cracks badly ... ugh !! our snowflakes are ash from yesterday's fire on the mountan above the houses. JUST above along the firebreak! Your photo reminds me of Star Wars. We missed the snow here. I'm kind of disappointed. The old snow still on the ground is dirty and needs a couple new inches to make is sparkle again.